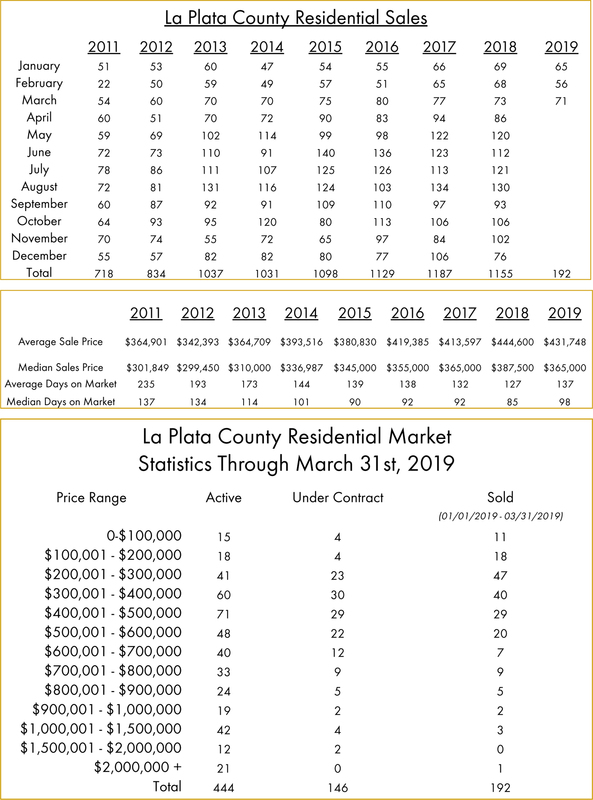 This week, we have the month-end numbers for La Plata County residential real estate for the month of March. With 71 total sales, we are only two sales behind March of last year. With 192 total sales, we are still slightly behind last year at this time, which had 210 total sales. The median sales price is $365,000, which is certainly a strong historic median sales price, but still behind the 2018 year-end median sales price. The average days on the market is a bit longer than last year’s year-end, again indicating a slightly slower year in comparison to last year. While we often compare numbers directly to the previous year, it’s worth noting that the median sales price and days on the market numbers are still on the strong end of the market, historically. We have had exceptional last couple years for La Plata County real estate, so even though the totals lag a bit behind 2018 at this point, they are still near the top of the records. Additionally, this is only the end of the first quarter of the year. We are just entering the spring selling season, and our peak activity tends to occur during the summer months. We still have several months ahead to determine how the year will play out in terms of real estate transactions. As always, if you have any questions, please contact us. We will be hosting an open house on Saturday at 161 Salt Brush Street from 12-2. We would love you to stop by and say hello!